Description: Get real with some faux hair extension styles. Experiment with dreads, cornrows, or afros. Taisha knows how to rock any look at any time! Instructions: Use your mouse to click on and through the floating clothing, hair, accessory, and background options to style Taisha with a lovely new set of locks. This water fight is for all the marbles. Who will get to ride on the line backers broad shoulders? Who will wind up soaking wet? Let the games begin. She knows how to move, how to walk, where to go and what to do. She is the hot stepper and her style is on fire. Get sucked into a smashing romance with this lovely couple of astronauts as they dash off into the great big never forever. Covered in decals and stickers, and of course, any color you want! Get crazy with a custom manicure complete with ring and bracelet accessories. Create your avatar and pick a cool outfit. Design your room and decorate your way to the top. Rank other rooms and compete for the first place. For a summer of fun, this lady have decided that she would try on plenty of different activities. Help her to create a look for each of her occupations. 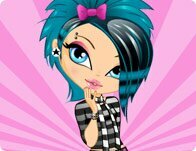 Get emo-creative with trendy clothes and accessories! You'll be blown away by the might and majesty of antique windmills in all their glory. Look good as you experience the fashion of a foreign land in this exciting adventure.